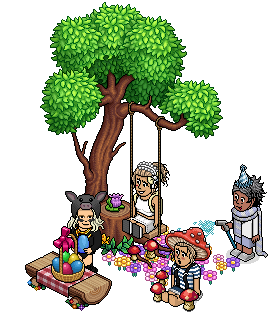 As everyone knows it is Easter, and what better way to spend Easter than eating chocolates and playing Habbo am I right? This year myself, Court, Nick and Kirst have decided to make a maze for you all to take part in. This maze is 8 rooms long, with a wide range of different rooms, from escape to telephrase to even rollers! This maze has a bit of everything and we decided to not only would you be able to complete the maze but there also be more competitions to win even more coins! This maze will be a most wins maze, every day the highest wins on the leaderboard will win 50c and an exclusive bar for the forum. That means there is 3 winners and only 3 exclusive bars to give out! As well as this maze we also have an extra competition which is counting how many "Basket of Eggs" you can find throughout the whole maze, the first person to find ALL of the "basket of eggs" FIRST will win 50c! But all the correct answers after the first win will be put into a draw and the name that is picked out of the generator will again win 50c as well as the userbar above! All answers will need to be sent in a PM to @Tradition or @Court! It's as easy as that, we hope you all come and pay us a visit at the maze and take part!